We are in the Parkwest Shopping Center. This is on the corner of the 101 and Northern Ave, one exit north of the University of Phoenix Stadium. Anytime you’re dining out, whether it’s to catch a Sun Devils or ‘Cats game with wings and beer, or an outing for the entire family, you want high-quality, handcrafted food and drinks, which is exactly what you’ll find at BJ’s Restaurant & Brewhouse in Peoria, AZ. As soon as you arrive you’ll notice our relaxed and friendly atmosphere, our helpful service and our extensive menu with something for everyone. 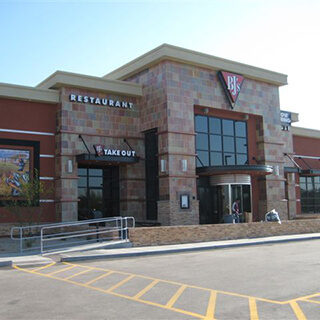 At BJ’s Restaurant & Brewhouse, we’re always Pursuing Amazing™ and it shows in everything we do from our signature pizza and cocktails to our incredible pasta favorites and craft beer. We offer great kids’ menu items, delicious desserts, shareable appetizers, snacks and small bites along with many gluten-free and lower-calorie options. Everything at BJ’s Restaurant & Brewhouse is carefully crafted with your enjoyment in mind. We take pride in everything we serve and nowhere is this more apparent than in our excellent selection of award-winning craft beer. We feature many always-on-tap beers such as our Harvest Hefeweizen®, HopStorm® IPA, Piranha® Pale Ale, BJ's Oasis® Amber, Nutty Brewnette®, Jeremiah Red® and more. You can also find amazing seasonal beers and selections. Regardless of your beer cravings, you can satisfy them at our Peoria, AZ Restaurant. Our brewers are always Pursuing Amazing™ to make sure that everything we pour is of the highest quality. Come see us at BJ's Restaurant & Brewhouse and find something to love in Peoria, AZ. Come in to BJ's Peoria to beat the heat and watch your sporting event. Great atmosphere! Great food! The home of your Arizona Cardinals!